Find happiness in a delectable fruity yogurt dessert recipe that comes together in no time – COOL WHIP and yogurt are the perfect partners, combined with layers of fresh strawberries, blueberries and blackberries! Stir Cool Whip gently into yogurt. 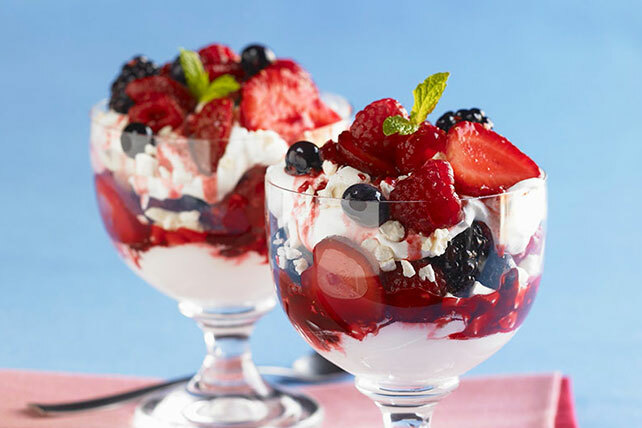 Layer yogurt mixture and berries into 4 parfait glasses or dessert bowls. Serve immediately or refrigerate overnight. Top with fresh mint sprigs. Try using any flavour yogurt.